Chicago-based Core Acquisitions is planning an extensive renovation and repositioning of Chatham Centre, an office building on Roselle Road in Schaumburg. A boutique commercial real estate investment firm plans to spend $7 million renovating an office building on Roselle Road in Schaumburg. Chicago-based Core Acquisitions in planning an extensive renovation and repositioning of Chatham Centre, a Class A office building. Chatham Centre is a 10-story, 205,000-square-foot office building on the southeast quadrant of the new I-90/Roselle Road interchange. Existing tenants include Sprint, Sagent Pharmaceuticals, Chatham Executive Suites and Paccar. New tenants will be DB Schenker and Wozniak Industries. As part of a multimillion-dollar renovation, Core Acquisitions plans to upgrade the lobby and outdoor terrace and enhance on-site food service operations. The lobby will include a “bleacher style” seating area, patterned after one in the Merchandise Mart, where people can work, eat, collaborate on projects and hold informal meetings. A new conference center and fitness center were completed in 2017 by the previous owner. Construction of the improvements is scheduled to begin immediately and should be complete by the end of the year. The building is 70 percent leased. Firsel said the top floor, which totals about 20,000 square feet, is available. Chatham Centre is also offering the building’s top signage rights to a large user. “We already have seen tremendous leasing activity. With our renovation plan, we are confident that we will be offering beautiful and efficient office space, along with must-have amenities,” said Bradley Joseph, principal at Core Acquisitions. 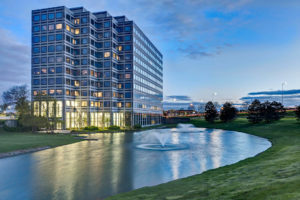 Core has hired Colliers International in Rosemont as its exclusive leasing agent and property manager and D+K Architects as its design and architecture firm.